Sally Ride passed away today. She was 61 and died from pancreatic cancer. Many will remember her as the first woman to go into space. She was the mission specialist for mission STS-7 aboard the shuttle Challenger which launched on June 18, 1983. She secured her place in history that day and became a role model for young girls all over the world. I know I was not the only young girl who watched in awe as the Challenger launched into space with the first woman on board. I was 9 years old and that was when I decided I wanted to be an astronaut. A dream that I held onto for many years. During high school my school hosted a space program which allowed students to participate in a simulated space launch and mission. I do not remember if NASA sponsored the event, but I do remember that they would send astronauts out to visit and that the students would be allowed to visit NASA and we would be given back stage tours of the facility. It was an incredible experience for the any student who was interested in the space program. In 1991, Sally Ride came to visit our high school. It was an amazing moment when I was able to meet her and ask her some questions about her own journey to becoming an astronaut. She was incredibly gracious to a 17 year star struck girl. I will never forget her kindness and honesty as she answered my questions. She had a genuine smile which she was quick to share as she recounted her own experiences. I will never forget how she explained that in order to become an astronaut I would have to major in Math and Science. I was fascinated with space, but not with math or science! That became a life changing moment for me. Although, I still follow the space program closely and love to read about it, it is not my dream any longer. 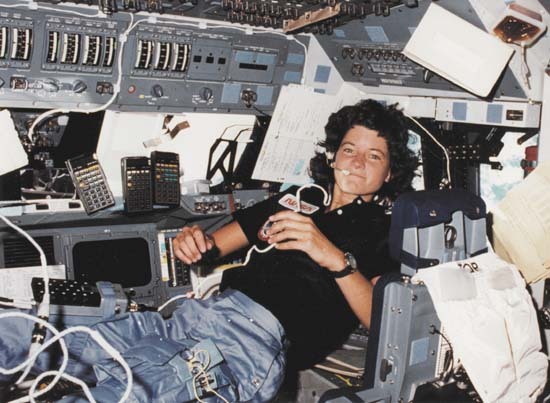 I am so thankful for a woman named, Sally Ride. She opened a new world to young 9 year old girl and then many years later, she was gracious and kind to a 17 year old filled with questions and uncertain about her life path. May her family find comfort in knowing she was a blessing to me. Sally was a wonderful role model for so many. I remember you meeting her and the impression she made on you. I pray her family finds comfort in knowing her impact on so many young girls and know her soul is soaring higher than any space shuttle could every carry her.